Chandra mohan Arya Post Graduate Scholar, Dept. of Panchkarma, Rishikul Campus, Uttarakhand Ayurveda University, Haridwar, Uttarakhand, India. Sanjay Gupta Associate Professor, Dept. of Panchkarma, Rishikul Campus, Uttarakhand Ayurveda University, Haridwar, Uttarakhand, India. Vatarakta is more distressing and common metabolic disorder prevalent in present era. It is Vatapradhana Tridoshaja Vatavyadhi where Rakta is main Dushya. Vata is a predominant Dosha in Vatarakta, when it is excessively aggravated with vitiated Rakta is called Vatarakta. Vatarakta is correlated with gout in modern science. Gout is an abnormality of purine metabolism causes hyperuricemia and deposition of monosodium urate crystals in joints. Pain is predominant symptom of gout, which disturbs day-today life of the patients. The Panchakarma is not only a important component of Ayurvedic treatment but it is also forms the fundamental basis of Ayurveda therapy. The different procedures like Swedana, Vamana, Virechana, Basti, Sirovirechana, Raktamokshana focus on the purification which detoxifies the human body, i.e. the correction of the metabolism at molecular level. These detoxification procedures are essential components of the management in various metabolic disorders. So Panchakarma is an unique approach in the management of Vatarakta. ARYA, Chandra mohan; GUPTA, Sanjay. MANAGEMENT OF VATARAKTA W.S.R. TO GOUT THROUGH PANCHAKARMA. 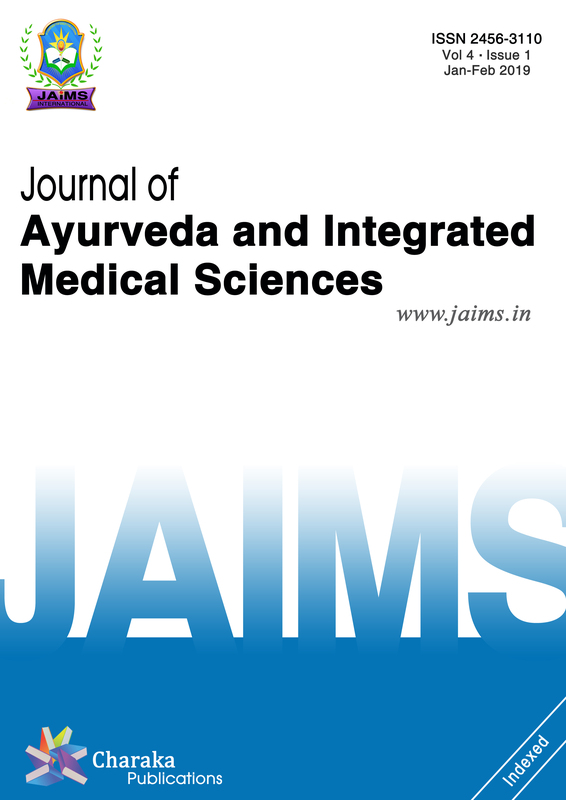 Journal of Ayurveda and Integrated Medical Sciences (ISSN 2456-3110), http://www.jaims.in/index.php/jaims/pages/view/Citation, v. 3, n. 4, p. 136 - 139, sep. 2018. ISSN 2456-3110. Available at: <https://jaims.in/index.php/jaims/article/view/614>. Date accessed: 25 apr. 2019. doi: https://doi.org/10.21760/jaims.v3i4.13298.